In this post we are implementing a Hidoku solver (Hidoku is yet another fine number puzzle) that uses a depth first search, branch cutting, limited (intelligent) successor generation and some automatic simplification. Usually, a Hidoku is a quadratic board consisting of n x n fields – but rectangular or other forms would be possible as well. 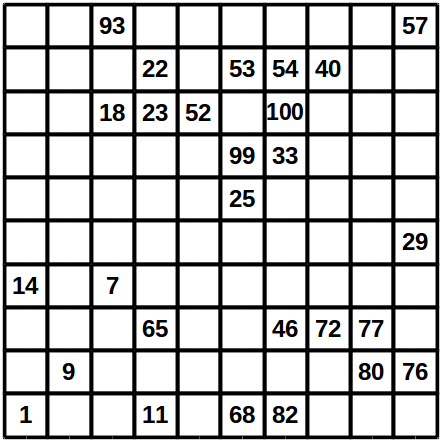 With each Hidoku, some fields are already pre-filled with numbers at the beginning. The game goal is to fill in all other numbers so that an ascending number queue is built: each number has to be adjacent to it’s successor, with adjacent meaning in an adjacent horizontal, vertical or diagonal field. Those adjacent fields are what we call a field neighborhood. The first and last number (e.g. with a 10×10 board they will be 1 and 100) are usually amongst those pre-filled into the board – for the player knowing where the queue starts and ends. See e.g. here or here to try out some online Hidoku examples for yourself. self.nparray: the standard n x m numpy array representation of the game board, with the numbers present on the board written to the y/x position of the array. self.nrs_yx_dict: dictionary of numbers filled to the board and their corresponding tuple of y/x positions. This allows fast lookup of the y/x position a number is filled to. self.nrs_left_to_place: list of numbers that still need to be placed on the board. Allows for slightly faster lookup of still missing numbers. self.nrs_placement_possibilities: list of possible placements as numbers and their corresponding y/x positions (representing positions this numbers could be filled to, given the current state of the board). This list enables much faster access to where numbers could get placed on the board. It is created initially (for the first node in the search tree) and for all successor nodes in the search tree possibilities that became impossible just get removed. self.field_connection_status: lists how many connections each field in the board currently has (0 to 2). A connection exists if the number preceding or succeeding to the number in the field is present in the field neighborhood (with the neighborhood including all adjacent fields: vertical, horizontal and diagonal). These connection stats enable quick checks if the board is already invalid (more on that later). The connection stats get handed over to preceding nodes in the search tree by updating the neighborhood and the field itself the number was filled to. We now look closer at how some of these are created and later used inside branch cutting. With the first node in the search tree, self.nrs_placement_possibilities gets created and filled. Succeeding nodes obtain a copy of it with those possibilities removed that became invalid by placing preceding number to the board (by doing the distance checks described below again). Given the numbers pre-filled to the board, all other numbers can be filled to those fields only that lie within the allowed distance of numbers already filled to the board. An example: if nr. 2 if filled to the top left field (position 0/0), nr. 2 can only be placed within vertical, horizontal and diagonal distance 1 of field 0/0, nr. 3 within distance 2 etc. Hence, this boils down to a simple (but pretty effective in reducing computation complexity) series of distance checks, in which each number X gets checked against each number Y already filled to the board. These checks are only performed if abs(X-D) < max(board_height, board_width) - 2 (otherwise the numbers can be placed on the board without any restrictions caused by each other, as the board is too small for such). The core of such a distance check is rather simple: nr. X can be placed to a certain y/x position on the board, if the horizontal and the vertical distance to the position of nr. Y is at max. abs(X-Y). In our search tree we need to detect dead ends early (boards that cannot yield a valid solution anymore) in order to exclude them from further search, hence speeding up the complete search. for each number left to be placed on the board: is there still at least one field left that number can be placed on? for each field still empty: is there at least one number left that can be placed on that field? If at least one is not fulfilled: the board is invalid an can be excluded from further search. if the field is filled: does it have its preceding and succeeding numbers placed in its neighborhood, or enough free fields in the neighborhood for them to be placed there in the future? If not the board is invalid. if the field is not filled: does it allow to be a connection for any pair of numbers in its neighborhood? Can it still be reached (entered and exited) from the outside? E.g. an empty field with fully filled neighborhood can only be reached if there can a number be placed on that field that has its preceding and succeeding number already filled to the neighborhood (or a free field in the neighborhood in its place). This essentially boils down to neighborhood number permutation check: if we don’t find a valid (still possible) permutation of numbers in the neighborhood for which we can fill a still available and valid number to that field, the board is invalid. For the solved board the order of how fields got filling does not matter. Therefore, within our depth first search, we do not care for the search path, but only for the obtained board state (we do not care how a board could have evolved to it’s current state). The question is: how to generate the required subset of successors (as this will influence the future search complexity)? We only generate successors from filling a single field on the board (with all numbers that can be filled to it) – as we can generate all possible board states from this, without searching multiple search paths (which all lead to the same results). As field to be filled we chose the one with the least possible amount N of numbers that can be filled to this field – and generate one successor per number possible. If there is a number that can be placed only on an amount A of fields that is smaller than N, we instead fill this one number to all those fields and generate one successor per filled field (as we only obtain A instead of N successor nodes then). This way we minimize the amount of branches and keep the overall branching factor low – something a rational human player would strive for as well. Note that we do not miss any possible solutions as a result of this limited successor generation. As a side effect, this also results in basic board simplification: if there is a field that only one number can be filled to, it will be filled next – and generate a single successor only, which is usually called simplification. The same is true if we have a number that can only be filled to a single field. # Hidoku solver implementation using depth first search, branch cutting, intelligent successor generation and a little simplification. # - use a path finding algorithm, e.g. A* + manhattan distance instead of using max(y_dist,x_dist) to determine possible minimum distances. """gets executed if in __main__ (see bottom of file).""" """str representation of nparray board.""" """initialize the board. meant to be called on first board in search tree only.""" """generate yx position index of nrs.""" """1 huge list containing tuples about which nrs are placeable on which fields.""" """for all filled fields: generate field connection status.""" """generate field connection status for the given nr on y and x pos.""" """fill given nr to given field.""" """split placement possibilities per nr.""" """check if given nr is possible on y,x pos in field.""" """check if given nr on the given y,x is within range of other nrs on the board.""" """generate list of nrs still to placed on the field.""" """tuples of (y,x) pos of neighborhood.""" """get all fields that surround the specified field.""" """get neighbors to the given pos that are not yet fully connected.""" """check if the field can be reached from it's neighbors permutations.""" """check that the given field can still be reached by means of predecessing and successing nr.""" # sanity check: would there be a field that has only 1 nr to be filled with? """get solution path up to this point.""" """get distance between nr1 and nr2 on board or None if at least one of the nrs is not present.""" """distance between pos1 and pos2.""" """check if board is still valid.""" """checks if the field is solved.""" """read board from a textfile."""